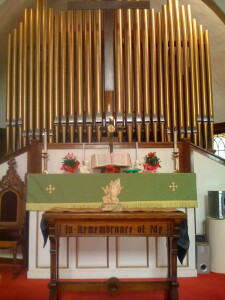 The Sea Bright United Methodist Church has a wonderful Organ behind the Altar, as well as a piano. Our music is traditional hymnal. The organ was donated in 1893 by Mr. E.S. Nesbitt. Read this informative article about its history. The Northern Shore Cluster Choir started in the early 1970s under the direction of Ms. Donna Nilson, a school-teacher and Music Director at the Oceanport United Methodist Church. The Choir conducts a Musical Service (Cantata) that lasts 90 minutes at least 3 different churches for Easter, and 3 for Christmas.